Ray and Alice Defenbaugh of Biggville, traveled to the 51st U.S. Grains Council's Annual Board of Delegates meeting in San Francisco, California this March. 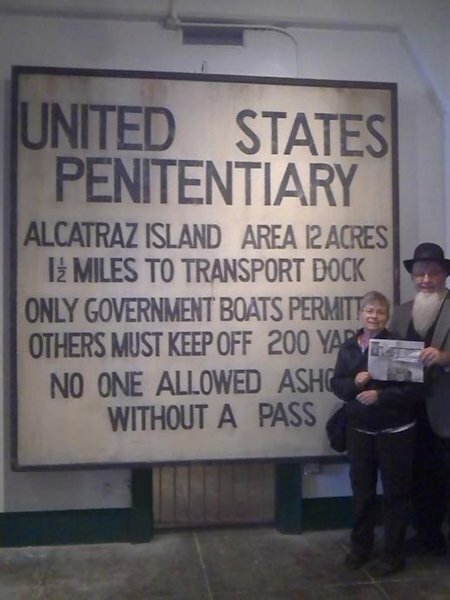 While there, they took "The Quill" along to "THE ROCK" on a tour of the famed federal prison of Alcatraz, situated 1-1/2 miles on a small island in San Francisco Bay. The prison housed many notable inmates including Al Capone (Scarface), mob leader from Chicago brought to trial through the determined Eliot Ness, leader of a legendary team of law enforcement agents nicknamed The Untouchables. In 1972 Alcatraz became a national recreation area and received designation as a National Historic Landmark in 1986. Visitors reach the 2 acre island by ferry ride from near Fisherman's Wharf. The site houses the oldest operating lighthouse (1854) on the west coast of the United States. When you go on a trip, take "The Quill" along and have your picture taken with it and then send it to us. Let's see where all "The Quill" can travel.